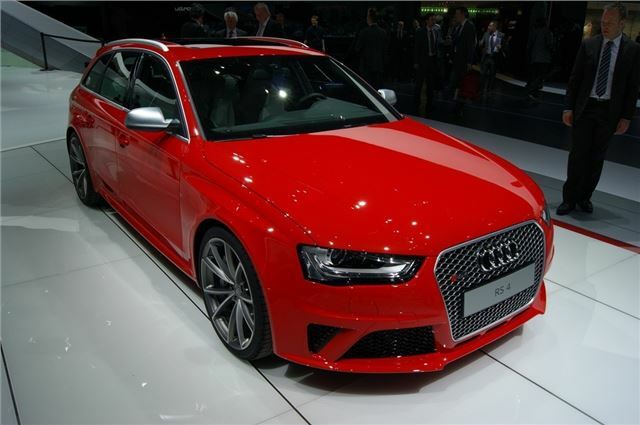 Audi has revealed its long awaited RS4 at the 2012 Geneva Motor Show. The high performance version of the new A4 was shown as an Avant estate and is powered by a 4.2-litre V8 engine developing 450PS. It will go on sale later this year with the first cars arriving in September and although prices have yet to be confirmed it’s expected to cost around £60,000. While Audi has produced fast S4 models recently, there hasn’t been an RS4 since the much-loved second generation model which went off sale in 2008. Audi says the new RS4 will be exclusively available as an Avant as the RS5 is effectively the replacement for the saloon model. The RS4 uses the same V8 engine as the RS5 and the hand built high-revving unit develops 430Nm, giving it a 0-62mph time of just 4.7 seconds. That’s slightly faster than the BMW M3 saloon which does it in 4.9 seconds. But where the RS4 really trumps the BMW is with its quattro four-wheel drive which means superior traction, particularly in the wet. Inside the RS4 is trimmed completely black apart from the roof lining which can be specified in Moon Silver. There’s chrome trim on the switches and controls along with carbon inlays. Brushed matt aluminium, piano black or stainless steel mesh trims are available as options. There are also standard heated and electrically adjustable front sports seats which come in a leather and Alcantara trim. Bucket-style seats are available as an option.